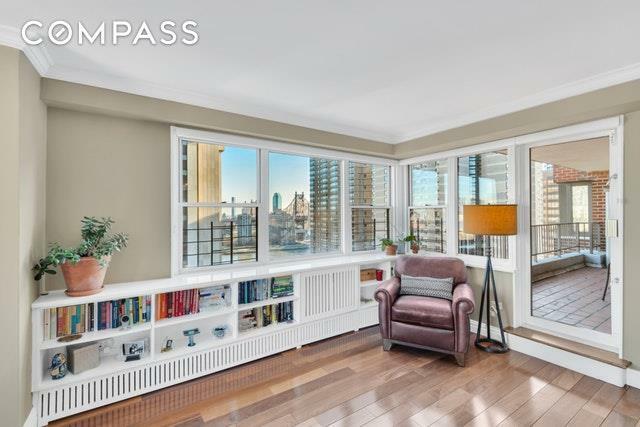 Expansive Upper East Side Four Bedroom, 3.5 bath home with a large balcony and incredible views as far as the eye can see. No detail was spared in the renovation of this immaculate home. 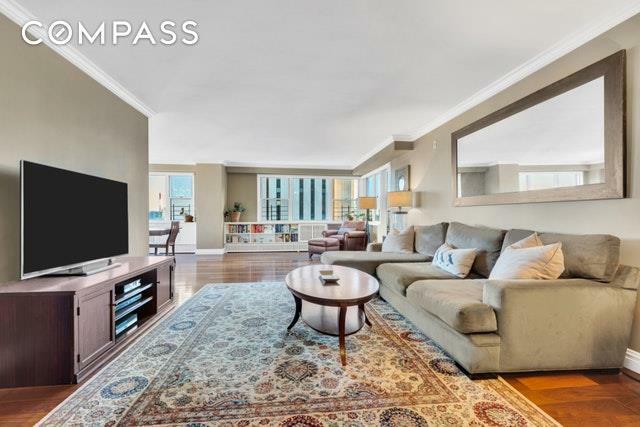 Enter into a gracious foyer which leads to your expansive sun-flooded living room with views of the East River, a separate corner dining room with open exposures overlooking the landmarked buildings to the north and gorgeous Rockefeller University to your east. The windowed, open kitchen has been expertly renovated with custom cabinetry, top-of-the-line stainless steal appliances including a subzero refrigerator, Wolf oven and vented stove top, built-in microwave, marble counter tops and marble breakfast island the perfect place to enjoy your morning coffee as the sun streams in. This split bedroom layout is ideal with two huge bedrooms down the hall, a renovated en-suite bathroom with classic subway tile and a half bath for your guests. On the opposite side of this sprawling home you will find your grand master bedroom with two walk-in closets and a renovated en-suite bath with walk-in shower, plus a fourth bedroom with its own en-suite renovated windowed bath. 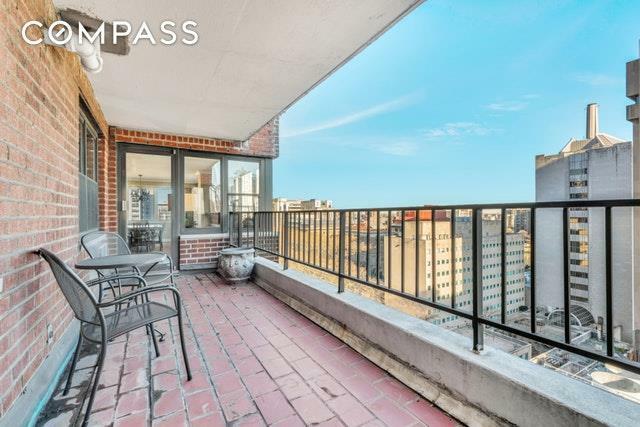 Other features include hardwood floors throughout, moldings, incredible closet space with closet interiors, custom built-ins that provide extra storage and house the through wall air conditioners and heat plus your very own 21' east-facing balcony where you can watch the sun rise. York River House is a full service building with a 24 hour doorman, concierge, fitness room, childrens playroom, furnished, landscaped roof deck, bicycle storage, private storage units, and a parking garage located in a wonderful Upper East Side location across the street from the foot bridge to the East River Promenade where you can exercise or relax. 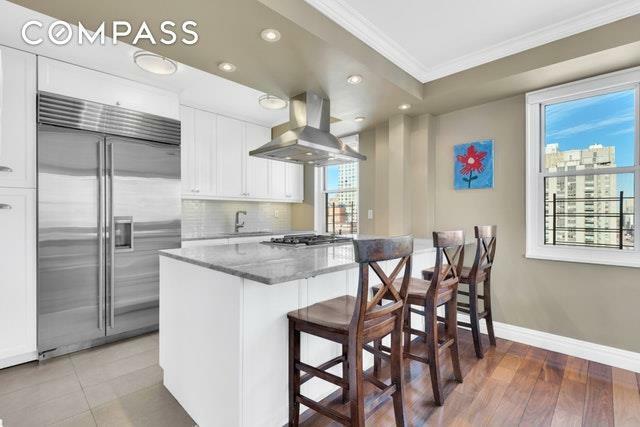 Listing courtesy of Stacey Froelich of Compass.